Far away on the edge of a great creek, that stretched inland from the endless sea, there lay a peaceful village. Here the husbandmen led a happy, prosperous life. They rose early, so that in the cool grey morn they heard the lark, all invisible in the height of the dawn, singing the morning hymn that he never forgets. As sunset came stealing on, they returned to their homes, glad of the rest that nightfall brought to them. In the autumn, when the harvesting was to be done, they worked late, as they were able to do; for at that time the kind Sun and his wife the Moon have a compact that they will help those who work at the harvest. So the sun stays up a little longer, and the moon gets out of her bed in the horizon a little earlier, and thus there is always light to work by. The red, broad, full-faced moon that looks down on the husbandmen at work is called the Harvest Moon. The Lord of the Manor of this peaceful village was a very good, kind man, that helped the poor always. At meal-time the door of his mansion stood open; and all who were hungry could enter if they chose, and take seats at the table, and be welcome guests. This Lord of the Manor had three children, Sibold and May, and one little Baby Boy just come home who had no name as yet. Sibold had just reached his eighth birthday, and May was within two months of her sixth. They were very fond of each other – as brother and sister should be – and had all their plays together. May thought that Sibold was very big and strong, and whatever he wished to do she always agreed to. Sibold loved finding things and exploring; and at different times the two children had been over all the domain of their father. They had certain secret haunts that nobody knew of except themselves. Some of these were very queer, delightful places. One was in the centre of a hollow Oak tree, where so many squirrels lived that the branches were quite like the streets of a town, with their going to and fro. Another place was the top of a rock, which was only reached by a narrow path between high bushes of ivy. Here there was a sort of great chair made in the rock, which just held the two; and here they often brought their lunch, and sat half the day looking out over the tree tops to where, far away in the distance, the white edge of the horizon lay on the glittering sea. Then they would tell each other what they thought about, and what they would like to do, and what they would try to do when they grew up. There was also another place, which was their favourite of all. It was under a great Weeping Willow. This was a mighty tree, many hundreds of years old, which towered aloft above the other trees which dotted the sward. The long branches fell downwards so thickly, that even in winter, when the leaves held fallen and the benches were bare, one could hardly see into the hollow that lay within. When the new spring clothes came home, the whole tree, from its high top even to the mossy ground from which it rose, was a mass of solid green; and it was difficult to get within even if one knew the way. In one place one of the trailing branches had, a long time ago, been broken in a great storm, winch had laid low many forest trees; but the branches which hung next to this sent forth new green shoots to fill the empty space, and so the opening was covered with thin twigs instead of strong branches. In summer the leaves covered all with a mass of green; but those who knew the opening could push the twigs aside, and so enter into the bower. It was a most beautiful bower. No matter how strong the sun glared without, it was within cool and pleasant. From the ground even up to the top, till the very roof where the dark branches meeting made a black mass, all was a delicate green, for the light without came through the leaves softly and gently. Sibold and May thought that so the sea must look to the Mermaids, who sing and comb their long hair with golden combs down in the cool depths of the ocean. When they told the poor Poet that the One he loved best was lying sick in the shadow of danger, he was nigh distraught. For weeks past he had been alone; she, his Wife, having gone afar to her old home to see an aged grandsire ere he died. The Poet’s heart had for some days been oppressed with a strange sorrow. He did not know the cause of it; he only knew with the deep sympathy which is the poet’s gift, that the One he loved was sick. Anxiously had he awaited tidings. When the news came, the shock, although he expected a sad message, was too much for him, and he became nigh distraught. In his sadness and anxiety he went out into the garden which long years he had cultured for Her. There, amongst the bright flowers, where the old statues stood softly white against the hedges of yew, he lay down in the long uncut summer grass, and wept with his head buried low. He thought of all the past-of how he had won his Wife and how they loved each other; and to him it seemed a sad and cruel thing that she was afar and in danger, and he not near to comfort her or even to share her pain. How in youth they twain had met and in a moment loved. How his poverty and her greatness had kept them apart. How he had struggled and toiled in the steep and rugged road to fame and fortune. How amid all this dreaming of a happy time which might come, he had kept silent as to his love. How he had never seen her or heard her voice, or even known her habitation, lest, knowing, he should fail in the purpose of his life. How time-as it ever does to those who work with honesty and singleness of purpose-crowned the labours and the patience of his life. How the world had come to know his name and reverence and love it as of one who had helped the weak and weary by his example; who had purified the thoughts of all who listened to his words; and who had swept away baseness before the grandeur and simpleness of his noble thoughts. How success had followed in the wake of fame. How at length even to his heart, timorous with the doubt of love, had been borne the thought that he had at last achieved the greatness which justified him in seeking the hand of her he loved. How he had come back to his native place, and there found her still free. How when he had dared to tell her of his love she had whispered to him that she, too, had waited all the years, for that she knew that he would come to claim her at the end. How she had come with him as his bride into the home which he had been making for her all these years. How, there, they had lived happily; and had dared to look into the long years to come for joy and content without a bar. How he thought that even then, when though somewhat enfeebled in strength by the ceaseless toil of years and the care of hoping, he might look to the happy time to come. But, alas! for hope; for who knoweth what a day may bring forth? Only a little while ago his Dear One had left him hale, departing in the cause of duty; and now she lay sick and he not nigh to help her. All the sunshine of his life seemed passing away. All the long years of waiting and the patient continuance in well-doing which had crowned their years with love, seemed as but a passing dream, and was all in vain-all, all in vain. Now with the shadow hovering over his Beloved One, the cloud seemed to be above and around them, and to hold in its dim recesses the doom of them both. Thus he moaned, and raved, and wept; and the bitter hours went by him in his solitude. 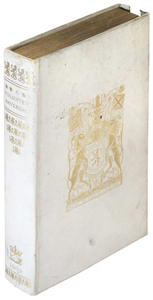 Collection where “The One Thing Needful” was first published. Spent with His faring through the burning day. The gentle Mary took her wonted seat. Soft came His words in music through the gloom. The burden; Mary helpeth not at all? 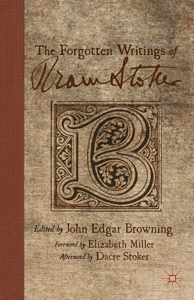 On December 25, 2012 Palgrave Macmillan released The Forgotten Writings of Bram Stoker edited by John Edgar Browning. This collection of fiction and nonfiction is without a doubt the largest collection of previously unknown writings by and about Bram Stoker ever published. 17. Sir Henry Irving and Miss Ellen Terry in Robespierre, Merchant of Venice, The Bells, Nance Oldfield, The Amber Heart, Waterloo, etc.